Rangers have played three games in the Europa League so far this season, but they are yet to wear any of their three new Hummel kits in their default formats. Funnily enough, they have worn all three parts of their home kit, in the order of shirts, shorts and socks. For the first leg of their clash with FK Shkupi at Ibrox, they wore all-blue with the visitors in all-white – oddly, the Hummel chevrons on the socks seemed extra large. Then, for the return leg in Macedonia, the home shorts were used with the away shirts and socks. Then, last week, Steven Gerrard’s side made the trip to take on NK Osijek. The Croatian side wear blue and white hoops, so the expectation was that the new orange third kit would be called upon, but there was a fly in the ointment regarding the advertising of betting firms. The solution was for Rangers to apply numbers – and the Utilita logo on the back – to a set of tops in the same design as those used for training (though the ones used for actual training have a black crest) as they won 1-0. The club said it was a fourth kit, and the difference in crests does suggest that – in any case, what makes something a training shirt as opposed to a match shirt? It revived a tradition of wearing red and black emergency kits in European competition. In 1996-97 – when all-blue was also used, away to Ajax but not Auxerre – Rangers faced Grasshoppers in Zürich. Their blue home and white away clashed with the Swiss side’s halves, and so a red version of a popular adidas template of that time was used. Then, a year later, the club were in Nike rather than adidas but the away kit was still primarily white. Their opponents in the second qualifying round for the Champions League were IFK Gothenburg of Sweden, who wear blue and white stripes. In the first leg, a 3-0 away defeat, Rangers wore their home kit with Gothenburg in red but for the return, a 1-1 draw, a special one-off red shirt was produced. 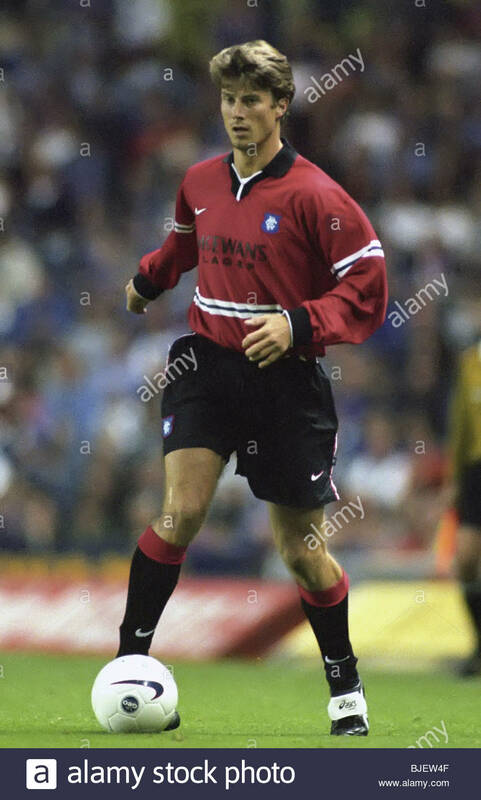 While the horizontal-stripe design bore similarities to the Arsenal away kit, as far as we know this particular design was unique to Rangers. It bares some similarities with the 1860 Munich kit of that period, although the design it seems to be unique, indeed. That last Nike red kit, always thought it looked superb. Cheers Greg, not sure how I missed that, fixed now! As I said … superb shirt ! Probably totally wrong as it was a long time ago but always had it in my head we wore it against Auxerre but as I say it was a while back. I think Greg is right, that it was prepared for the Strasbourg game in the expectation that they would have to change but they were allowed to wear the home shirts with Center Parcs logo, blue shorts and black socks. 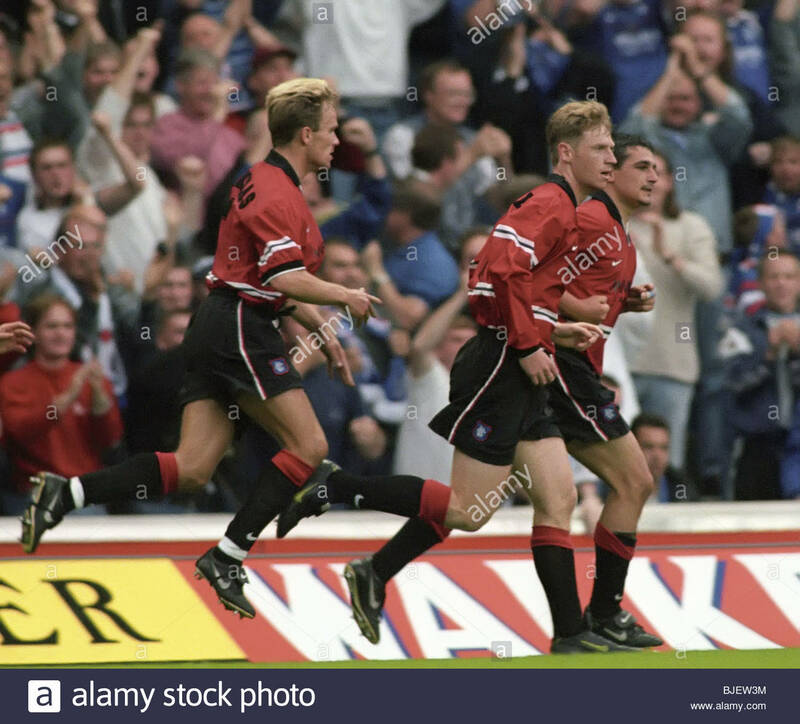 They were still with adidas when they played Auxerre in 1996-97 – as I found out thanks to Jay Mansfield’s blog – https://leftmidfielder.wordpress.com/2017/08/29/ger-seys-a-short-history-of-rangers-kits-from-1987-onwards/ – the shirts used there, also with Center Parcs, featured the fabric of the previous 1994-96 shirts! Oh and Greg, thanks once more for the heads-up, fixed again! Cheers Greg, I never mind being corrected like that, all in the name of accuracy!